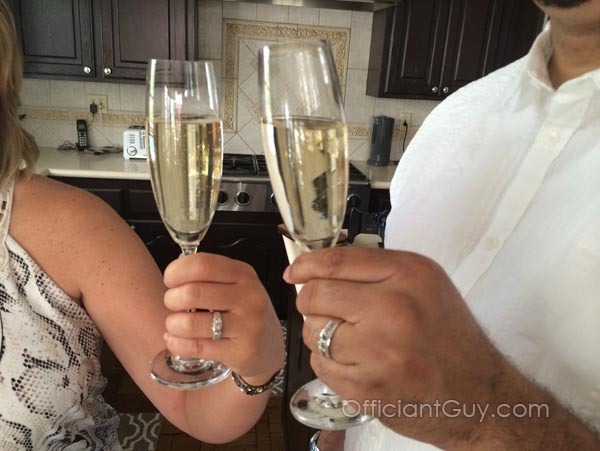 I am the wedding officiant every year for many eloping couples who want a private wedding ceremony with just the two of them and me. I am authorized by the LA County Clerk’s office to issue California confidential marriage licenses. I can issue the marriage license right before a wedding ceremony anywhere in California. This way the engaged couple does not have to trek to the County Clerk’s Office, wait in the marriage license line, and be seen doing so. Celebrate your private wedding ceremony in Southern California by yourselves. It’s a private moment. California is the only state in the United States that has the confidential license, a special kind of private marriage license. The Registrar Recorder – County Clerk seals the information on the marriage license from public view so that nobody can have access to the information on it without a court order or if one of the married parties requests it with notarization. Regular public marriage licenses, complete with all your private information, are accessible to anybody who requests it. That doesn’t sound like a good idea. I have many local clients, including many high profile couples who want a private “legal” wedding ceremony to tie up the loose ends before or after their public wedding ceremony. Other couples have a simple private ceremony at home so they will not have to navigate the frustrating bureaucracy that is often necessary in order to acquire a valid marriage certificate after their wedding in a foreign country. If you are planning to get married outside of the USA, this is what I recommend you do. It is much easier this way. Couples will often travel from around the USA and from all over the world to get married in a California destination wedding because they don’t want anyone to know about their wedding or they want to keep their personal information private. I get it. I suggest it. 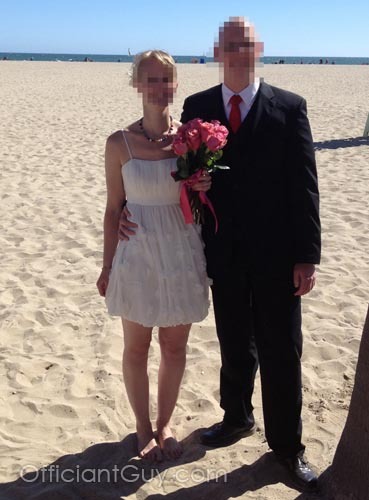 The bonus is that they travel to sunny Southern California for a beautiful wedding in an incredible place. This is a couple who came from another state to be married in California with a CA confidential marriage license. The reasons for private wedding ceremonies vary, from not wanting angry ex-partners to know, to wanting to keep it to themselves, to keeping it out of the press, to getting “married” on another day for family and friends, to insurance reasons, to military deployment, to worry about homophobia with LGBT weddings, to not wanting the ton of spam mail that will come their way with a public marriage license, or to protecting personal details that identity thieves can steal. You name it! I’ve heard it all, and I understand. Gay weddings are often a reason to want a private wedding ceremony. 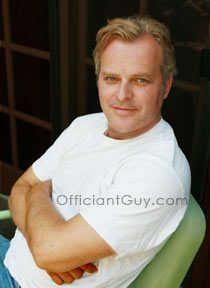 My job is to officiate your wedding and issue your marriage license in an easy and non-stressful way. I am also beholden to the law that declares that I’m not allowed to discuss my clients’ elopement. Since I’m a lawyer, as well, I understand and respect the arm of the law. By law, I cannot reveal anything about it to anybody. The County Clerk’s office cannot reveal anything about your wedding. Your confidential marriage license is filed and then sealed from public view.